All Maps to be submitted get posted here, then players can download and review them. Once they have been playtested successfully by several players, I will make one final review of the map & then post them on ToH's maps page. Edited by sphere at 04:29, 23 Sep 2006. H5 Map - Index Just a heads up. Thanks, Guz. The Map Index is meant to be for all maps, not just multiplayer. I suggest mapmakers post their scenarios in both threads. Edited by Betruger at 13:49, 22 Feb 2007. It's a balanced 1v1 map, with 3 ways to reach your opponent, the shortest, obviously, being guarded by lots of spectral dragons. Also, I'd like to point out, that since patch 1.3 there is absolutely no need to create those .pak files and putting them in \Data folder. It is perfectly sufficient now to put .h5m file in the \Maps folder. It's more natural and user friendly. We just had a very nice and close game on this map, my nerco vs his haven. I beat him to the utopia by 1 turn, but then I just barely lost the final battle, failing to surrender/run when there was still time Good game Ghast! At this point I can say that map is 100% bugfree, and pretty balanced too. Edited by niagaran at 14:43, 23 Sep 2006. Currently fumbling around after completing the map on normal to get reaquainted with the various strategies available to complete a game. A very good recreation of the original. Like the H3 version getting to the middle quickly is key but having 3 same "like" castles removes potential unbalances. A rich map of many paths and potential for huge heroes and armies. Random Wars Has Twists And Suprises - Made For Multiplayer / Hotseat. - Take Into Consideration This Isn't an easy map nor a short one, no chance to rush the opponent - must kill at least 40 lvl 7 just to get to him , altough map has a big potential to expand your forces fast and strong. New Version 3.0 , Fixed (hopefully) all the bugs + added more eye candy and new nice feature . 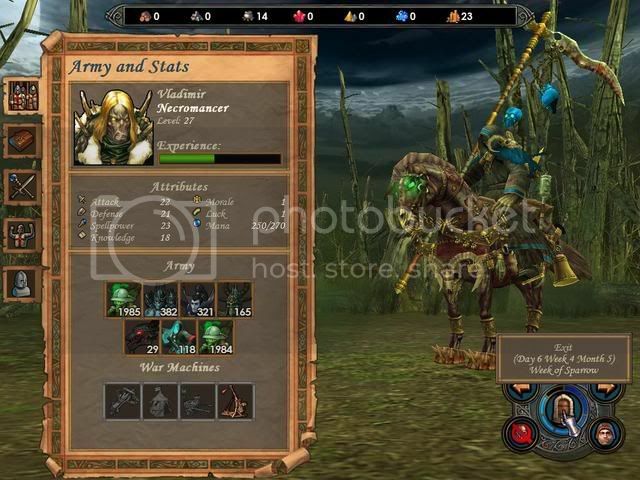 Install Notes: place under /data folder (inside homm5 game directory ) ,enjoy ..! No. players : 2 . If you need the pic for the map i can email it or something..
Then to JB: I'll need an h5m file of the battle for honor map so I can reconfigure! Edited by jb239 at 20:25, 23 Sep 2006. Edited by MysticPhoenix at 22:01, 23 Oct 2006. Both maps of great quality, thanks JB. On HG red player gets access to some chests without defeating level 4 guards. It is near the military station at the very left of red player's territory. No other bugs noticed so far, but I haven't finshed the map so far. Keep up the good work, jb. What about some Giant War, Deth of Beth, Quest for Victory You vs Me? Any other projects still in planing phase? To be clear - both the .pak file and .h5m are exactly the same files only diffrence is diffrent extension. So basically map files can come either as .h5m files or as .pak files. I think its more convenient to have maps as .h5m files but it really don't matter since they are same file. Keep uo the good work, jb. What about some Giant War, Deth of Beth, Quest fro Voctiry or You vs Me? Any other projects still in planing phase? thanks Ill fix that bug with the next update. I might make Giant war next.. I always liked that map a lot haha. Edited by chessie_e at 10:26, 01 Oct 2006. 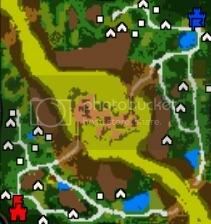 New map here, be sure to tell me about any bugs. Also see if you can find the hidden artifacts, there's one close to each player. I'm sure the cheating NPH (non player heroes ) will find em fast..
Edited by chessie_e at 15:03, 24 Sep 2006. Edited by sphere at 16:02, 25 Sep 2006. - I think I found a "minor" bug on Hourglass map. Playing red, and you send out a hero to the small island ( with a shipyard and 1 pile of resources ) you can actually dock on the other island ( with the Lighthouse and etc. ) And it's just beside the lighthouse that you can dock. Intended ? or just adjust the guard(s) on that side e.g. lvl 2 guarding the wood-mine and or the lvl 3 guarding that side of the island. [EDIT] - Instant Travel is not disabled - Intended or ? I can understand why you probably wouldn't have done it on purpose ( having the Garrison in mind ) - But as I see it it's either tone down the garrison or leave the Instant Travel, but again then it wont be THAT BIG an end fight as ( if I read between the lines correctly ) you originally had in mind. - BTW - I think that Betrugers map : Dead_Mans_Lake_2 is a great map and should have a place amongst the future maps on the report/download page. Nice map indeed. Edited by sxshopper at 11:25, 27 Sep 2006. So here is my map for TOH, it's called Fatal Controversy 5, and it's based on well known map Fatal Controversy for Heroes4. Of course i made some changes so that the map is a lot better. Dimension door and summon boat disabled. if you email it to me at jasonb619@gmail.com I can put it on my server. Also if you want a free place to upload files, you can try a place like www.sendspace.com itll hold the file until no one downloads it for 7 days. thanks, ya those are both bugs. Ill adjust the guards so u have to fight to land and I will disable instant travel. Ill probably play test it another few times before posting the 1.1 version. As for Battle for honor.. I did make a few adjustments. Mostly I slightly lessened the middle guards and did a few minor tweaks. Edited by niagaran at 00:30, 26 Sep 2006. After winning on Normal then Hard I am currently battling on Heroic. After 8 weeks my opponent crashed through the border guards like confetti but decidied not to crush my main hero now holed up in center castle. He took one of the wings and stayed there for 2 weeks. Since then it has been a case of hit and run whilst building my main hero up and staying out of range. Has been a long slow process but I have managed to banish him back to his side and retook all of mine.